So your child has a cataract? Today is World Sight Day – a day that’s pretty close to my heart. If you’ve had much to do with Kids Eye Gear you will know Dane’s story and if not, you can read more about it here. In short though, Dane was born with a congenital cataract which was found when he was 6 months old. We were lucky that Dane’s condition was discovered and we had medical services available to us which meant he now has fantastic vision. However, if our GP hadn't have been aware of cataracts likes she was, it could have been a very different story. For that reason, raising awareness of congenital, and other, cataracts is extremely important to us. There are absolutely many more eye conditions that can affect sight and are worthy of our attention on World Sight Day but this year, we’ll focus on cataracts. A cataract is a vision problem, affecting the lens, which is normally defined by blurred vision and seeing everything in a shade of yellow. Double vision and seeing “halos” around objects are other signs too. Cataracts can develop over time with age, or you can be born with them. Affecting approximately 2.2 children out of every 10,000 births, congenital cataracts can cause lifelong vision issues if left undiagnosed and untreated. It’s for this reason that one super Australian mum set up a cataract focused charity. Cataract Kids Australia is an Australian charity aimed at improving the support for children with cataracts and their families, to enhance clinical care and to build connections with research across Australia. Director of Cataract Kids Australia, Megan Prictor, founded the charity organisation after her own child was born with cataracts in both eyes. "We went through a very difficult time when our son was about 18 months old", Megan says. "He has to wear contact lenses to correct his vision, but he refused to have anything to do with them. It became a daily struggle and huge anxiety about whether we could get the lenses out each evening. Once or twice we ended up back at the clinic with four people pinning him down on the floor to get them out. It was terribly distressing and isolating." "Around that time we started to hear about other families who were going through challenges like late diagnosis because the issue was missed early on, or dealing with contact lenses that didn't fit and constantly fell out. There was a lack of reliable information tailored to Australian families, and because the condition is quite rare, the advice given by clinicians can vary widely. It was also hard to find out about the latest research both in Australia and internationally. We decided to start Cataract Kids to try to address some of these issues." Finding out your child has a cataract and potentially may go blind, and/or need eye surgery, is a scary thing. You may know nothing about this condition or procedure and feel very unsure and confused. There are many doctors’ visits, hospital visits, follow up appointments and ongoing care, which can feel overwhelming and be financially draining. This is one of the reasons why I love the idea behind Cataract Kids Australia. Their website is full of cataract information, tips, tricks and even information on funding. They know what it’s like to go through something like this and are providing the support network that families need. Sometimes all you need to hear is someone else’s story and suddenly you don’t feel so alone. So on this day – World Sight Day – be aware of your vision and how to look after your eyes. There are four main definitions of cataracts. 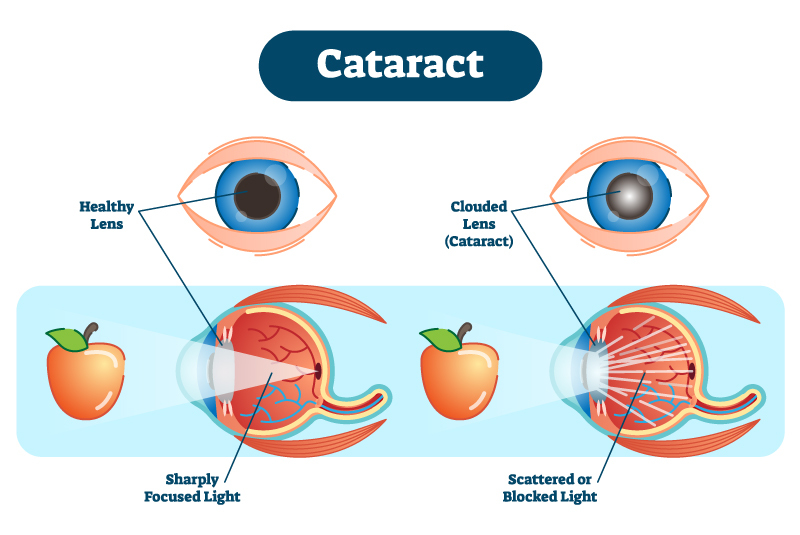 A cataract can be unilateral or bilateral, meaning in one eye or both eyes. They can also be congenital, which means a baby is born with it, or can be an adult cataract, which onsets from ageing. These can be mixed around in a few ways, for example, Dane had a congenital unilateral cataract. Sometimes children develop them as toddlers or older, either randomly or because of injury to the eye. In Australia, eye checks are done on newborn babies while they are still in hospital. A congenital cataract should be picked up there, but they aren’t always. Something to look for is a white spot in your child’s eye, or if an eye appears to not be tracking as well or seems “lazy”. Having children’s eyes tested as regularly as their health is another great way to pick up on any early issues. From personal experience, it’s a good idea to ask your GP to do a red reflex test when you get immunisations done (or at well baby checks if you don’t immunise). Babies can’t tell us something is wrong and children don’t realise their vision is bad if that’s how it has always been. Another great resource to check out is the work of Sandra Staffieri at CERA. Signs in yourself or older persons is blurred or cloudy vision, things appearing yellowish, double vision, trouble seeing at night or driving at night, increased frequent lens or glasses prescription changes, sensitivity to glare, and seeing “halos” around things. As we age, our eyes should be tested regularly. The faster we pick up on vision problems, the faster we can help slow them. Because of the sensitivity of the eye and lens, each cataract incidence must be taken case by case. Common treatments can include: doing nothing (watch and wait method to determine more accurately what is needed), a lensectomy (surgical removal of the affected lens performed by an eye surgeon in hospital), and occlusion therapy (patching). Your journey with cataracts could include one or all of these treatments. To read Dane’s story click here. To find out more about Cataract Kids Australia click here.